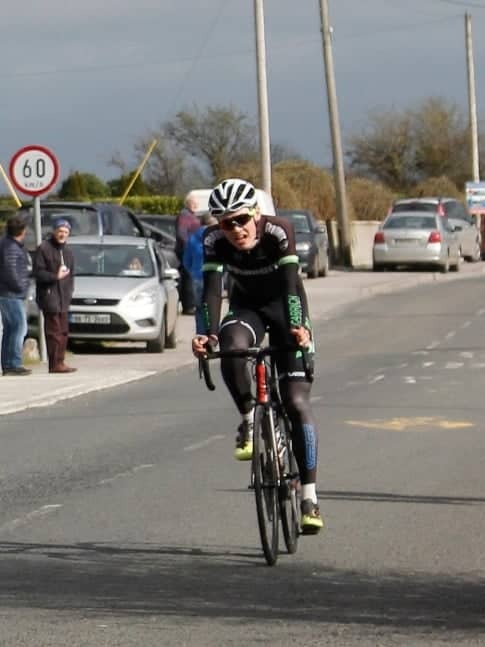 North Tipp Wheelers were the hosts of this weekend’s racing. On Sunday morning, our riders headed for Cloughjordan. The course was 40km of flat, exposed roads which made for a tough race. The A1/A2 event required the riders to complete three laps of the circuit. A break of three got away at about 15km in and stayed away for the majority of the day but never got any more than a one minute lead. The Carrick lads were all safely in bunch and riding well to keep the gap at a manageable distance. At the beginning of the final lap, a small group including Daryl Kearns got away. Jamie Blanchfield, John Hodge and a few others rode across to make up twelve riders in what was now chase group, closing in fast on the original break. By the time they caught them, one rider had jumped clear and was up the road on his own, heading for the finish line. Blanchfield began attacking the chase group as they were not working well together and he eventually got clear with one other rider. They soon caught the lone leader but in the final few kms following some attacking, only two riders remained, one of which was Blanchfield. The finish came to a sprint with Blanchfield taking a fine second place on the day. Daryl Kearns finished in the chase group to take ninth place.